Patients needing new life-saving medication could have to wait two years after the UK leaves the EU, experts are warning. 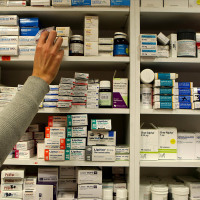 The UK could be pushed to the back of the queue, behind the EU, US and Japan, if Britain stops being a member of the European Medicines Agency (EMA) - something Health Minister Jeremy Hunt has indicated is likely. Sir Alasdair Breckenridge - former chairman of the UK's Medicines and Healthcare products Regulatory Agency (MHRA), says new cancer drugs could be among those affected. Speaking on BBC Radio 4 's Today programme, he said: "The UK market compared to the European market, of course, is small, so therefore there will be a delay in getting new drugs - important new drugs, anti-cancer drugs, anti-infective drugs - for patients in the United Kingdom." Anyone receiving treatment for cancer can take out medical travel insurance to cover any overseas trips. Japanese drugs firm Eisai employs 450 people in Britain and agrees with Sir Breckenridge's assessment. David Jeffreys, Eisai vice president and spokesman for the Association of the British Pharmaceutical Industry (ABPI), said: "The early innovative medicines will be applied for in the USA, in Japan and through the European system and the UK will be in the second or indeed the third wave so UK patients may be getting medicines, 12, 18, 24 months later than they would if we remained in the European system." Mr Jeffreys is urging the Government to agree a co-operation deal with the EMA, even if it did not retain its full membership. This is something he says the ABPI believe is a priority. However, the Department of Health says Brexit will offer "new opportunities" for the swift introduction of new drugs from other markets. A spokeswoman told the Independent newspaper: "In fact, Brexit brings opportunities in this area, and we will be focused on whether we can secure even faster access to the latest innovations for British patients. "So we are already taking action to ensure the UK continues to be a world leader and our cross-agency Brexit task force is considering the future regulatory roles the MHRA could adopt."